Patsy Stephenson has been with Visit Austin for eight years and has worked in the hospitality industry for 20. Patsy was born and raised in Austin, spent a few years in Dallas, but “high-tailed it back” to Austin as soon as she could. 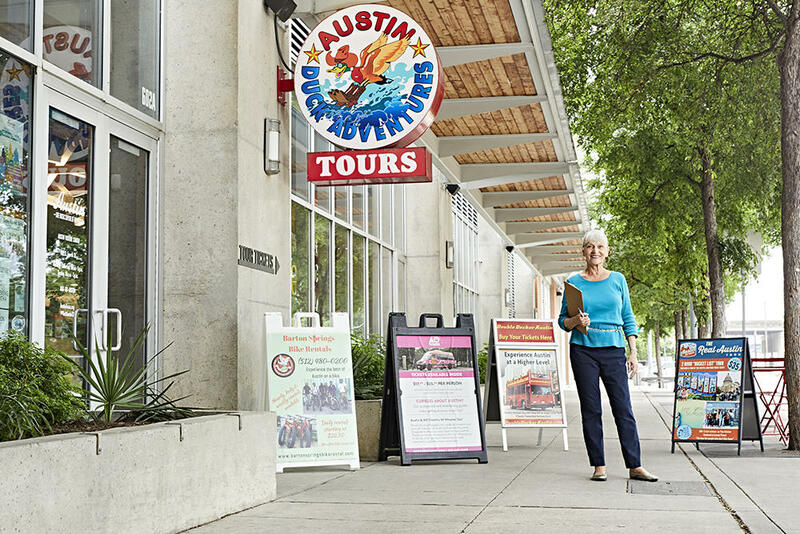 She coordinates walking tours and acts as a guide for public and private tours around Austin. One of her favorite memories was when she created a special tour for new workers in the Downtown Austin Alliance’s newly formed Ambassadors program. The Ambassadors are not only charged with keeping the streets clean, but they also providing a warm welcome and added information to visitors. She felt proud to be the one who was able to help them become knowledgeable about downtown Austin. Even a year later, she still gets friendly hellos from those Ambassadors when out on the street. Patsy suggests all visitors catch a live music show in Austin. She always makes an effort to recommend places likely to be a good fit for each particular visitor. She especially loves seeing the faces of young parents light up when she is able to tell them about family-friendly venues. Photographed at the Austin Visitor Center.